As of 2009, the population of Chad was estimated as being 10,329,208. 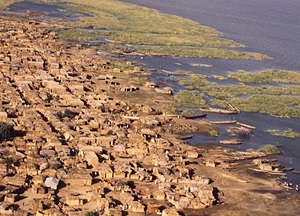 The country's capital and largest city is N'Djamena, which had an estimated population of 993,492, also as of 2009. The Chad Sahara is a magical land of emptiness, where man is insignificant and nature rules the rhythms of life. Timeless features of the Chad Sahara include limitless expanses of golden sand dunes, multi-coloured outcrops, spellbinding canyons, wind-eroded turrets, breathtaking arches and palm-filled oases, along with picturesque villages and prehistoric rock art. The colourful people of Chad have a unique culture crafted over centuries of isolation. Camel caravans still ply their products to lonely trade posts, while hardy herding communities eke out a basic existence, moving between temporarily fertile places. There are many surprises in this lost horizon, with towering mountain vistas and high windswept plateaux of red sandstone. Canyons and defiles have been etched by the elements over aeons into colossal blocks of inspirational designs. 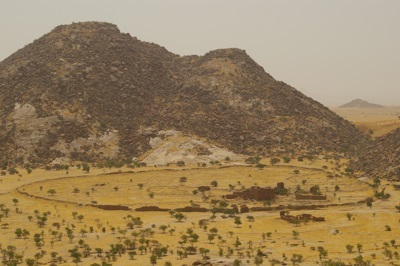 The peaks of the Tibesti in Chad are a strange mix; some are jagged and wild, like Tarso Tieroko and Pic Toussidé. Others barely show their presence, like Tarso Voon and the highest of all, Emi Koussi, a slumbering shallow-sloped giant set among a field of looming cones. In the east is the contorted massif of the Ennedi, separated from the Tibesti by vast plains and hidden lakes. The lakes are like mirrors, reflecting the vast open skies with a ripple of eerie dissent. The Depression du Mourdi is an explorer’s last frontier, an empty quarter of wild-eyed nomads and isolated oases. Inner sanctuaries of the Chad Sahara include little-known places like the Trou du Natron and the Guelta d’Archei. The country of Chad is just one small corner of a vast desert, but for now it is the jewel in the crown, a haven for Saharan addicts. Change is coming slowly to the communities in these remote and forgotten worlds, but the country has so far kept itself insular and isolated from its troubled neighbours. It has not always been this way, so this golden age of exploring Chad may be but a brief period of calm. We do hope not. Double-sided, indexed and very detailed map of Chad. Formerly the northern portion of French Equatorial Africa, Chad is famous among history buffs as being the jump-off point of General LeClerc's masterful march across the Sahara to Tunisia with Free French units loyal to the Allies, during WW1. In more modern terms, Chad is the site of Lake Chad, once a massive interior African lake, but now sadly depleted in size. The map distinguishes roads ranging from divided paced highways to tracks/foot-paths. Legend includes places of interest, mosques, lodges/rest houses, churches, pagodas/temples, clinics, hotels, airfields, national/domestic airports, nature reserves. and includes an inset of the capital N'Djamena. Your road guide for finding haunted bars, bed & breakfasts, bridges, campgrounds, cemeteries, churches, fire stations, hotels, lighthouses, mansions, parks, railroad tracks, restaurants, roads, rocks, schoolhouses, stores, theaters, and much, much more. Micronesia and Palau have long been known to diving enthusiasts for some of the most intriguing and spectacular dive spots on earth. Yet as the reputation of these islands spread, more travelers are looking to escape the modern Western world and become transported to a calmer, slower pace of life. The writers of this guide all lived, worked and played on the islands which they write about. First-hand knowledge, cultural insight, and personal recommendations allow visitors to feel like locals while enjoying the indisputable beauty of these islands and people. - Learn the history and culture of the islands from writers who have each spent years living with local residents. - Explore off-the-beaten-track locales relatively unknown to foreign visitors. - Navigate on the islands and among islands, enjoying the best of Micronesia and Palau. - Dive, surf, snorkel, and swim in some of the most stunning marine environments in the world. - Choose the best places to eat, sleep, shop, and visit based on reviews of all the major islands. Your road guide for finding haunted banks, bars, bed & breakfasts, bridges, cabins, camps, cemeteries, forts, hotels, lighthouses, mansions, Masonic temples, motels, museums, orphanages, parks, plains, restaurants, roads, souvenir gift shops, theaters, tombs, wells, and much, much more. Where to go to possibly sleep in a haunted bed & breakfast, hear ghostly wails in a theatre, going roller skating with ghosts, encounter a haunted doll, hike a haunted trail, hear spirits playing music, have a drink in a haunted pub, and see gravestones move on their own.